This site introduces you to the Lorton and Derwentfells Local History Society, L&DFLHS, its activities,its publications, and historical resources. Whether you live locally or not, you can join as a member for £8 annually. Each new subscription year starts in January. To see a poster for the next event in our programme, please click here. For more about the Society's role, please scroll down. The Society has its principal focus in the area of the English Lake District to the west of Keswick and the south of Cockermouth. 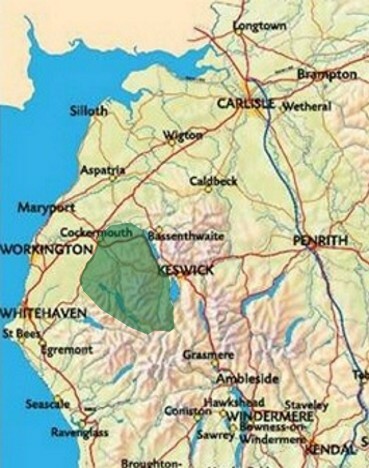 The map shows this area of Cumbria, formerly Cumberland. The old townships covered are Brackenthwaite, Buttermere, Embleton, Lorton, Loweswater, Mosser, Pardshaw, Whinfell and Wythop. The Society now has a Facebook page where you can keep up to date with our programme, follow links to relevant material and join the discussion about the local history of our area. You do not need a Facebook account to read the material, but you do if you wish to contribute. Go to our Facebook page by clicking LortonLocalHistorySociety. This new booklet They lie in Foreign Fields was published by the Society in October 2018. 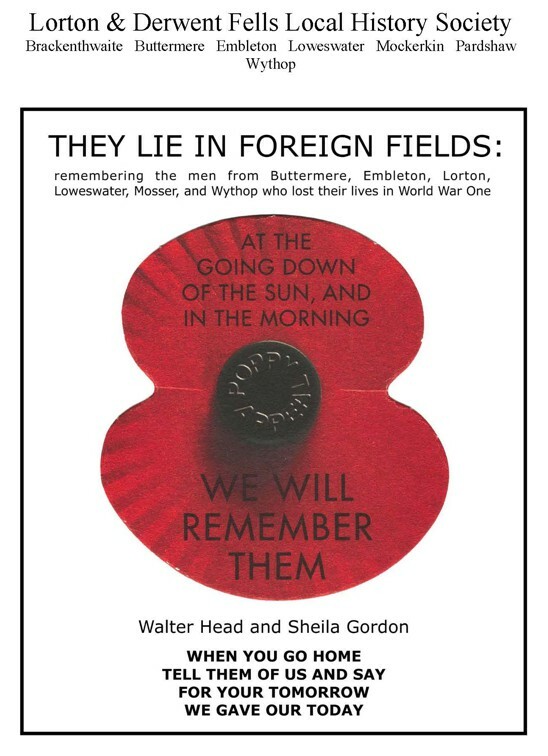 Authored by Walter Head and Sheila Gordon, this booklet remembers the local men who died in World War One. The booklet is not for sale, but a copy may be downloaded for personal use as a PDF (click the image above). The Society provides the Greenwood county maps of Cumberland and Westmorland at the original scale to view, download, and use freely. These maps were surveyed in 1821-3 at one inch to the mile. Click the image above to go to the Greenwood page. The Society is a membership organisation, run by an elected committee. It organises a programme of events for its members and visitors, primarily a series of bi-monthly talks. Additionally it organises historical visits and occasionally walks and exhibitions. It publishes a quarterly booklet called the Wanderer, has previously published The Journal, and occasionally publishes books and other material. Additionally it organises historical visits and occasionally walks and exhibitions. It keeps an archive of historical material related to the area, and provides support to other local and family historians. The Society is a member of the Cumbria Local History Federation, a founder member of the Cumbria County History Trust, and a member of the British Association for Local History.